Lymphedema is chronic swelling of a body part, most often an arm or leg, but it can occur elsewhere in the body as well. Often the condition is the unintended consequence of cancer surgery and/or radiation—referred to as secondary lymphedema. For others it is a congenital abnormality—referred to as primary lymphedema—presenting at birth, puberty or even mid-life. Lymph vessels are part of a one-way transport system which facilitates the return of tissue fluids back into the bloodstream. Along the way, this fluid is routed through lymph nodes which protect the body from infection and disease by storing and distributing the lymphocytes that attack dangerous pathogens. Metabolic waste and plasma proteins, which are too large to be returned, or reabsorbed by the venous capillaries, are also filtered via the lymph nodes. Anytime this lymphatic transport mechanism is compromised, proteins will accumulate, and the affected area will be at great risk for infection. This condition is progressive if left untreated. In latter stages, irreversible fibrosis (hardening of the tissue) occurs, with increased instances of chronic infection, or loss of limb function, not to mention the discomfort and deleterious effect on the patient’s overall physical and emotional well-being. World-wide, millions of people are afflicted with lymphedema. Breast cancer patients are at risk of developing lymphedema secondary to radiation or surgery. But everyone who has had cancer treatment that affects the lymph nodes needs to be aware of the possibility of lymphedema. What are the Dangers of Lymphedema? Perhaps the greatest danger is infection. 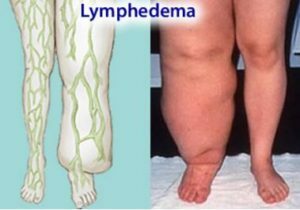 Because lymphedema leads to immune deficiency in the affected limb or area, persons with this disease are increasingly subject to infection, due to the inability of the stagnant lymph system to carry away impurities. Preventing infection is essential because each successive infection can further compromise the lymphatic and immune systems. In the most severe cases, infections can be life threatening. Left untreated, lymphedema can have other serious complications. Severe swelling, discomfort, hardening of tissue, damage to skin, or even nerve damage due to the heavy weight of the limb can threaten the usefulness of an arm or leg. In addition, persons with lymphedema may be affected by emotional problems such as depression or anxiety, particularly if they feel isolated and know little about the condition. Since the introduction of Combined Decongestive Therapy (CDT) in North America, the medical community has been able to offer a treatment for this condition. Newer interventions take advantage of advances in technology and microsurgery, but best practices still typically use them in some combination with CDT. There is a very active scientific community searching for lasting cures with the cutting edge research having a focus on genetics, lymphatic/immune system function, and pharmacology. Still for the majority of lymphedema patients at this time, regular—and ideally daily— CDT treatment is the most accessible option accomplished by a skilled therapist with a self-care regimen consisting of manual lymph drainage and compression bandaging, after which the wearing of compression garments is typically prescribed, along with an ongoing emphasis on nutrition, exercise, nail care, and risk awareness. Although this type of treatment has proved very successful, lymphedema therapists and educators are discovering the vital role of patient education in the prevention and management of this condition, as there is no “cure” and long term maintenance inevitably becomes the responsibility of the patient. Those patients who have the opportunity to learn the basic anatomy and physiology of the lymphatic system better understand the risks and their own condition, and they are more willing to make the commitment to learn and implement self-care techniques. With daily self-care practices, the likelihood of recurrence and/or infection is greatly reduced and patients have the peace of mind that comes with knowing they have a better chance of keeping the condition under control. Any patient undergoing cancer treatment, or anyone with a family history of primary lymphedema, needs to understand that they are at risk of developing the disease and know the symptoms to look for because early intervention can dramatically effect long term outcomes. Having a basic understanding of the lymphatic system and the principles of lymphatic return, prepares patient for changes should they occur. For example, If normal lymph transport capacity is ten times greater than normal lymph load (the accumulation of tissue fluid not reabsorbed by the venous capillaries), the body can quickly recover from traumatic injury or swelling. If the transport capacity is permanently compromised, for any reason, and this ten to one ratio decreases, tthen the likelihood of developing chronic lymphedema increases. A patient may remain in the latency stage of lymphedema for years following the initial insult until something as minor as a mosquito bite or an airplane ride pushes them “over the edge” and the swelling becomes obvious. There are, among other things, self-care techniques which can help restore lost transport capacity. The well-informed patient who is willing to explore and implement these safeguards is more likely to discover lymphedema does not need to control their life.